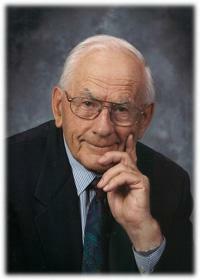 Mr. William L. (Bill) Hooper, beloved husband of the late Mrs. Elizabeth Marjorie Hooper of Lethbridge, passed peacefully home to his Lord and Saviour at the St. Michael’s Palliative Care on Tuesday August 28th, 2012 at the age of 92 years. He was predeceased by his wife Marge in 2006, parents Henry and Lennie Hooper, brother Jim and his wife Mary, and sister Eveline Quantz and her husband Les. Bill is survived by his sons Brian (Grace) of Calgary, Wayne (Debbie) of Lumsden, Saskatchewan, and Kevin (Lynette) of Airdrie as well as six grandchildren and 2 great grandchildren. He is also survived by his brother Stuart (Myrtle) of Didsbury. Bill was born on the family farm east of Didsbury where he attended local schools and helped on the family farm. He attended Mountain Bible School in Didsbury for two years which became the foundation for a life of Christian ministry and service. He enlisted in the army in 1943 where he served as a cook and his duties led from Vancouver Island, to Newfoundland to Wainwright. In Wainwright Bill met Marge Schwartz and after their marriage in September 1946, they moved to Regina where he attended Canadian Bible College. He pastored full time in Calgary and Mirror before moving back to Calgary because of health issues but took weekly services in Banff for 2.5 years. The family moved to Lethbridge in 1962 where Bill managed King Koin Launderette & Drycleaning until his retirement in 1983. Bill and Marge always had a heart for the Lord which motivated their involvement with Gideons and work in the church. Bill always had a love of singing and over the years sang solos, in trios and quartets, and until age 92 in the church choir. A Memorial Service will be held on Tuesday, September 4, 2012 at the EVANGELICAL FREE CHURCH, 4717-24th Avenue South, Lethbridge, Alberta at 2:00 PM with Reverend Dave Acree Officiant. Bill will be laid to rest on Tuesday, September 4, 2012 at Archmount Cemetery in Lethbridge preceding his Memorial Service. Our sincerest sympathy on the passing of your dad and grandpa, Bill. No matter the age or stage, it is not easy to let them go, but we know that Bill is enjoying the presence of the Lord he served. We regret that we are not able to attend the memorial service, but you are in our thoughts & prayers. Thank you for letting us know of his passing – we have good memories of times together with Bill & Marge.